Margaret Chan, Director-General of the World Health Organization (WHO). More than a third of women worldwide are affected by physical or sexual violence, many at the hands of an intimate partner, according to a new United Nations report that offers guidelines to help countries respond to this global epidemic. The report, Global and regional estimates of violence against women: Prevalence and health effects of intimate partner violence and non-partner sexual violence, represents the first systematic study of global data on the prevalence of violence against women – both by partners and non-partners. Some 35 per cent of all women will experience either intimate partner or non-partner violence, according to the report, which was released today by the UN World Health Organization (WHO), in partnership with the London School of Hygiene & Tropical Medicine and the South African Medical Research Council. It also finds that intimate partner violence is the most common type of violence against women, affecting 30 per cent of women worldwide, according to a WHO news release. The report details the impact of violence on the physical and mental health of women and girls, ranging from broken bones to pregnancy-related complications, mental problems and impaired social functioning. Among its key findings on partner violence was that globally, 38 per cent of all women who were murdered were killed by their intimate partners. Also, women who have experienced partner violence are almost twice as likely to experience depression or abuse alcohol. “This new data shows that violence against women is extremely common. We urgently need to invest in prevention to address the underlying causes of this global women’s health problem.” said Professor Charlotte Watts, from the London School of Hygiene & Tropical Medicine. Fear of stigma prevents many women from reporting non-partner sexual violence, the survey finds. Other barriers to data collection include the fact that fewer countries collect this data than information about intimate partner violence, and that many surveys of this type of violence employ less sophisticated measurement approaches than those used in monitoring intimate partner violence. The study highlights the need for all sectors to work together to eliminate tolerance for violence against women and to better support women who experience it. New WHO guidelines, launched with the report, aim to help countries improve their health sector’s capacity to respond to the problem. The guidelines stress the importance of training all levels of health workers to recognize when women may be at risk of partner violence and to know how to provide an appropriate response. They also point out that some health-care settings, such as antenatal services and HIV testing, may provide opportunities to support survivors of violence, provided certain minimum requirements are met. WHO will begin to work with countries in South-east Asia to implement the new recommendations at the end of June. 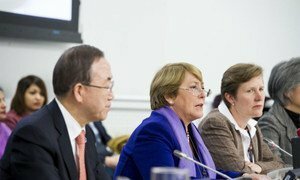 Top United Nations officials today welcomed an agreement by more than 130 Member States on the prevention and elimination of all forms of violence against women and girls, and urged governments to translate the outcome of the 'historic' gathering into concrete actions to protect and promote women's human rights and fundamental freedoms.